First of all we would like to wish our dear admin @Patipatigulipat and Raymond a great wedding day today! “Take one’s vows.” Meaning: to get married and take your wedding vows or make your wedding promises. “Tie the knot.” Meaning: to get married. “Walk down the aisle together.” Meaning: to get married (in this case in a church where the bride walks down the aisle to the altar). So, I hope this #EngTrivia session has been useful for you, fellas :) Have a great weekend! Once again, Congratulations to @Patipatigulipat and Raymond :) Have a great marriage life! :D We admins send our love for you both! Compiled and written by @daedonghae at @EnglishTips4u on Sunday, March 22, 2014. Who’s up to help complete a short story? Rearrange these jumbled letters and form a words to go with the story. Once upon a time, in a field full of [1. TRANRAFG] flowers, there were three tents built under the cool moonlight. People hustled to prepare for a celebration. Everybody [2. LOUIZANYX] awaited for tomorrow. Tables were [3. DEEDCAROT], chairs tied with sashes, and pretty chandeliers hung above the dance floor. “Poxy Panda, though you look great in the tail coat tuxedo, the party isn’t until tomorrow [4. NEENVIG].” said Richie Rat. “I’m well aware of that, Richie Rat. I just can’t wait [5. TONHEAR] minute to show the long tail I have behind me.” said Poxy Panda. “I’m so [7. TIXCEED] I think I will start hopping even in my dream.” said Billie Bunny. “He wouldn’t [13. PARTPIEACE] a headache in the morning.” said Popo Penguin, tapping his feet. “Come now, Raymond. You’ll be the best groom for Patty Owl.” [14. USREADS] Matcha Fish. “And your bride shall be the happiest girl to have you.” continue Poxy Panda, [15. YAPLING] with his new tail. 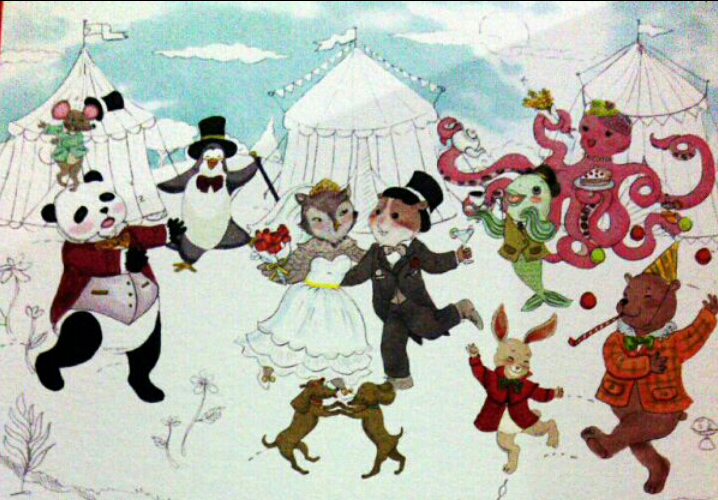 After everybody had cleared the decorated tent, Patty Owl [16. TREENDUR] one last time and think, “I can’t believe I’m really getting marriedtomorrow.” With the happy [17. HGOTHUT], Patty Owl slept with a wide grin. Rearrange the jumbled letters and complete the story. Unbeknown to you, fellas, part of the short story is true… A day after this article was posted, one of our admin walked down the aisle.